iPossessed is an iPhone/Android app that allows demons and spirits to possess your iPod or iPhone device. Symptoms include demonic whispering, violent screams, and in some cases violent rattling. DISCLAIMER: Because of the fickle nature of demons, spirits, and the like, plus the security features of the iPhone OS, there is no guarantee that possessed devices will appear on any of the usual paranormal detectors. We apologize for any inconvenience that may arise. -Timer to delay the ritual up to 999 seconds. 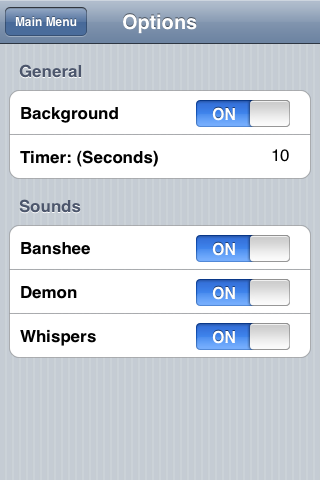 -10 total demonic sound effects. 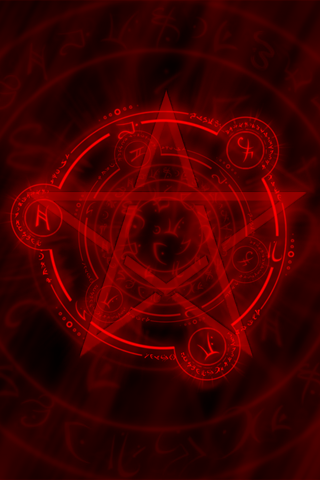 -4 different pentagram colors to represent the various spirits and demons. -"Cry Wolf" mode makes distracting noises to lure someone into picking up the device. -Mix and match the spirits and demons being summoned. -Pentagram flares up when spirits or demons speak. -Pentagram can be hidden to give a more innocent appearance. Works best on iPhone or Android phone but also supports iPod Touch (no vibration).